It is rainy season in Japan and greens wield power everywhere. I've been feeling even busier since April, but I think this idea is one of my delusions. I am a lazy person and I could never be "busy" in the meaning you use this word for! I'm probably feeling busy because I don't want to work hard. That makes sense to me. Meanwhile, I hope you've been doing super good! If you are interested in the magazine that I'm talking about, you may like to read Merche's this post. By the way, I always respect you and everyone who are nice to others in the on-line sewing community, and I'm also feeling so lucky that I can be a part of it. I'm not telling you that gifts matter, but I'm telling you about the atmosphere that we are creating there. I mean, supportive attitudes and environment. Thank you for the good air we breathe, you supportive hobby sewists!! As for the shirt, this was my first use of Patrones patterns and it was also meant to be a check for sizing/fitting. It is always good to know how different my frame is from the new-to-me company's targeted body, and I wanted to check it by using a very basic garment with narrower ease like this shirt. I rarely keep actual patterns (because, eh, I rarely trace) but I keep notes about what I did for adjusting the patterns to my frame, written digitally along with some photos, on every garment I make so that I can read my history whenever needed for future projects. Anyway, Patrones patterns seem to fit similar to the retailed garments and relatively true to the size. And also I had some adjustments to the shirt pattern for my frame, and I think these will be automatically applied to my future projects with their patterns. I love Andrea's collarless placket shirt, and I'm thinking this pattern with those plackets at this moment. 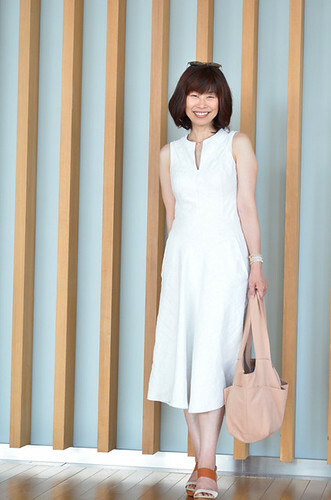 It can become a pretty summer vest kind of sleeveless blouse. I'll see. pattern: Shirt 45 from Patrones Extra, Easy Sew No.29 (Patrones Costura Facil) magazine, collar omitted. I finally made a Vogue 1247 blouse after seeing so many beautiful versions from all over the world. For my first version I used a lace cotton that was not very supple, and the blouse was ballooned quite a lot because of the fabric. But I love it as it is! This is a summer blouse which breathes a lot. I'd love to sew the next one with a different kind of fabric. Rayon? Linen? Don't know yet... I'll see. I also made my second Gilbert pants from République Du Chiffon. I used a very plain light beige cotton with a bit of stretch. Though there is nothing very unusual in them as a garment, I just wanted to let you know which pattern I used for them because some of you might be interested in the pattern for your casual, cute, useful and easy-going pair of "boyfriend pants". Front neck line was raised by 1.5cm. Front horizontal darts were lengthened by 10cm to make the blouse slightly flattened. Raw lace trim was placed in the front neck line. 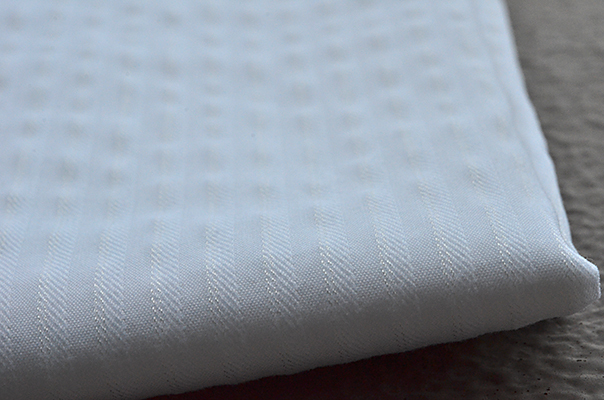 Bottom hem was executed by bias strip binding. Sizes for the pattern seem true to the measurements for me. As I used a cotton with stretch, the garment looks loose on me. No alteration to the pattern. In the last May, I had a small trip with two of my best friends, Chigu and Miho, to Lake Yamanakako that locates in the north side of Mt. Fuji. We went there not only to enjoy the grand view of Mt. Fuji, but also for scouting location for our premature idea. We are wishing to organize a kind of sewing-related mini retreat, which any hobby sewists can apply to join in, at Lake Yamanakako in May 2015. Not much has been decided yet or we have no concrete schedule or program either. However, I felt the location was perfect to get together with other like-minded sewists and to spend an extraordinary time as a retreat. Very soon we will need to discuss all sorts of things for making it happen. You know, we have to plan fun workshops and to arrange cool accommodations and many sewing machines etc etc. Please wish us luck and also please do join in if you will be in Japan in 2015! P.S. Thank you so much, Mariko, for this vogue pattern! I finally made it! May is over. Upon approaching to the end of Me-Made-May'14 challenge, I made a call for a meet-up and asked on twitter if any of participants could come to Tokyo on the last day to get together for celebrating the final day. Eight of us (including me) managed to come up to see each other under the very fine sky on that day. It was a really lovely day. On the day before, I felt that I had no proper clothes for the meet-up (a very ordinary problem among us anyway). The thing was, by the 30th my options had run out because I had an undeclared rule for not repeating items during the challenge. Almost being forced, I sewed a new dress in the evening. I sewed V2900 dress from Vogue Patterns again. In solid white linen denim. Wore it, loved it, and was glad that I sewed. ta-da! Today's report, done. 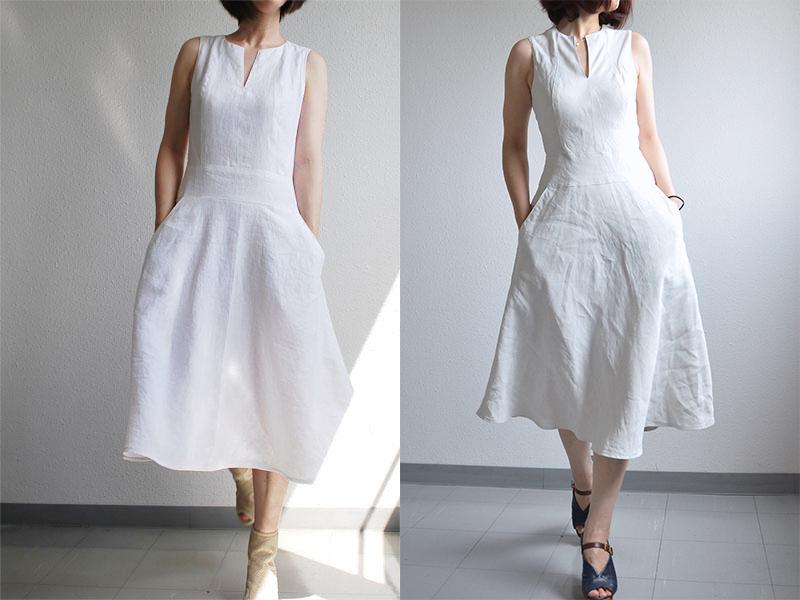 By the way, I once sewed a V2900 dress in plain woven white linen four years ago, and I'd say it was one of the most kindly recognized item of my handmade garments by non-sewists as well as by sewists. So I guess some of you may remember that dress too. And if you remember it, you may wonder whether I just replaced it with a new one because it was worn out or what is the difference. The answers are yes, and the grain lines. They have different grain lines. The former dress was cut in lengthwise straight grain. The new one was cut in bias. From similar fabrics. Because the material and pattern are almost (but neither fabric or pattern was completely same, I have to mention this) identical, the dresses seem to look almost same when you look at them separately in the pics. However, you may find it interesting to see them side by side in the picture below. Don't they give different impressions especially on human body and especially side by side? We all know grain lines influence shapes in the garments, nevertheless, it is very interesting for me to find that they give such different impressions. I'm not talking about which one looks better, or which one is better on me. I mean one dress looks more casual and more fresh and the other does more manipulated and more mature on me, to my eyes. Your impressions on them may be different from mine, but it is not very important today, the important thing is to witness that grain lines affect a very significant ingredient of how people look, if I am correct. please excuse me about the creases in the new dress. I should have taken care of them more.